Good point. i dont have a digital camera apart from my phone(good enough for me! ), I grew up using film cameras. Another aspect is when using a digi through a scope or macro adaptor you may not get a full image, and have to use the zoom function to cut out the vignetting-I get that when using my phones camera on my scope. I think the magnification is still valid tho. I'll agree completely that the purpose of words is to communicate and that the extent of magnification is important. The question is, which magnification, and what is it that we're trying to communicate? This is important stuff in my life. I take pictures, from landscapes to as small as light can handle. I build devices to take pictures. I write software to manipulate pictures. I use math to understand the pictures, and to enable building the devices and writing the software. I look at pictures, both my own and others'. I study the subjects shown in pictures. I read and write about all these things. I care a lot about concepts and how to communicate them. Defining "macro" in general to mean 1:1 or higher lens magnification destroys most of the value of the term given the current state of equipment. To know that a lens focuses at 1:1 magnification by itself (no added lenses or extensions) is very useful information about the lens. But to know that a picture was shot at 1:1 lens magnification says almost nothing about the picture or not much about the technique used to get it. Was that 1:1 on a 5x7mm sensor, 1:1 on APS-format DSLR, 1:1 on 35mm film, or 1:1 on 4x5 sheet film? (That's a 20:1 range of subject sizes!) Was 1:1 achieved by bellows extension, by adding a close-up lens in front, or by adding a teleconverter in back? Shooting "macro" means taking pictures that show more detail than unaided eyes could see in the real subject. If you like numbers, you can work through some examples of what this means. Here's a good one. Normal vision, unaided, is considered to be around 6 line pairs per millimeter at closest viewing distance. A line pair is one white, one black. You need at least 2 pixels per line pair to resolve them. More is better, up to around 4 pixels per line pair, after which there's no gain. So unaided normal vision corresponds to around 12-24 pixels per millimeter on the subject. Now we've got a numeric criterion: a digital image is "macro" if it has at least 12-24 useful pixels per mm of subject size. Using our forum's limit of 800 pixels, anything under 33 mm field width is definitely macro, anything over 66 mm could only be close-up, and stuff in the middle is ambiguous depending on how sharply it's rendered. Notice how closely this definition corresponds to 1:1 lens magnification in classic formats such as 35mm and 2-1/4 square film. So this "new" definition (which actually traces at least back to Kodak's book of 35 years ago) is really just a different way of formalizing what's always been important: "What can you see in the photograph?" "Was that 1:1 on a 5x7mm sensor, 1:1 on APS-format DSLR, 1:1 on 35mm film, or 1:1 on 4x5 sheet film? (That's a 20:1 range of subject sizes!)" Surely not a 20:1 range of subject sizes! The subject is the same size at 1:1 on any format, it is only the amount the final image is enlarged to produce the same sized print that alters the final magnification. A 10x5mm high subject at 1:1 occupies just 10x5mm of the emulsion or sensor, on 5x7mm sensor, an APS sensor, 35mm film or 4x5 sheet film. Life size means life size on the emulsion or sensor, it has nothing to do with eventual magnification on printing or reproducing it on screen. Therefore a 10x5mm subject at 1:1 may occupy most of an APS sensor but only a tiny part of 4x5 sheet film. In fact if you cut out an APS sensor sized portion of 4x5 sheet film including the 10x5mm subject they will both be identical. Also, if you enlarge this APS sensor sized crop of 4x5 film to the same print size as used for the APS sensor, the final magnification of both subjects will be the same. 1:1 ia a meaningful term as it is the same physical size on every format. 1:1 is an image the original size of the subject on the film or sensor, it does not mean the subject fully filling the frame in different formats. Apparently I failed to communicate the concept. Let me try again. If someone shows us a picture and says "This was shot on 4x5 film", then I will assume -- and I think that most people would assume -- that the picture represents all or most of that 4x5 film. Likewise for all the other formats. At 1:1 lens magnification, the 4"x5" film is filled by a 4"x5" subject, while the 5x7mm sensor is filled by a 5x7mm subject. That definitely is a 20:1 range of subject sizes. The numbers that you quote are completely correct, but they do not reflect the way that people use cameras or interpret photographs. What actually happened, of course, is that the person didn't really utilize a piece of 4"x5" film. They actually utilized an 8x10mm piece of film (an 8x10mm sensor), and wasted the rest. I understand very well what 1:1 lens magnification means, and how it interacts with subsequent enlargement. I also know that 1:1 lens magnification has often been used as a defining characteristic, to label a photo or camera setup as "macro" or not. What I'm arguing is that it's time to move on. There are better characteristics to use as a definition. Sensor size and lens magnification have no effect on picture quality (including DOF and resolved detail, when the aperture is set properly). They don't even have much effect on the technique needed to take the picture. Subject size, total magnification, and display or print resolution are what's important. One of the photomacrography.net administrators used to have a signature line that captures the essence of the debate. "Worry about the image that comes out of the box, rather than the box itself." Worrying about lens magnification is paying way too much attention to one detail of the inside of the box. IMHO, of course. I'm not too concerned about the nomenclature and semantics... but there are many microscope subjects for which most of us have no experience and therefore, no "size" reference. Now I am as guilty as the next guy in not using "scale-bars" in my photomicrographs, but I think they are very important with unfamiliar subjects. At least everyone should be able to include a fairly accurate one if they find the need to. You can consider me to be about 150% agreed with you about the value of scale bars. The number is larger than 100% because I'd go even farther than you've said, and note that scale bars are really valuable even for "familiar" subjects. 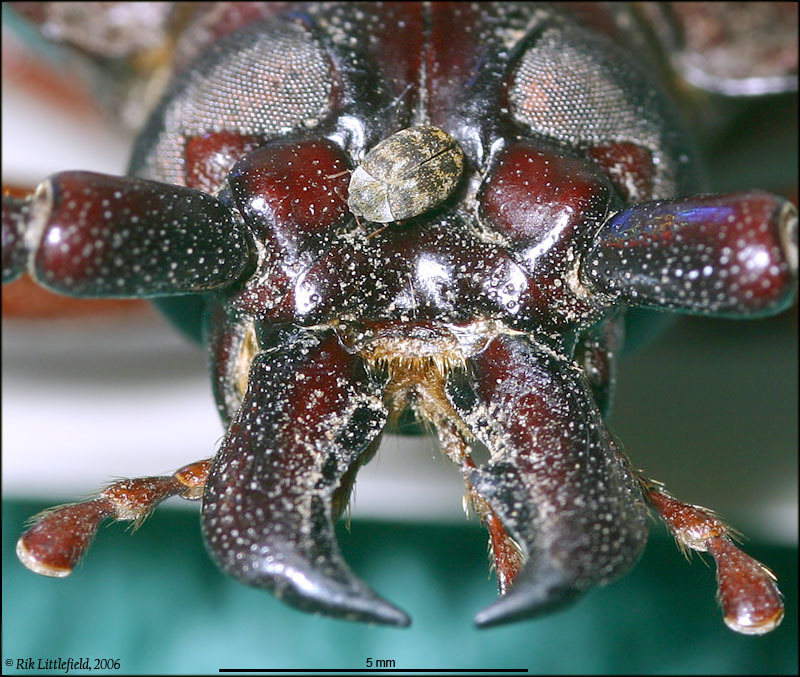 A few minutes ago I made the following picture, showing two beetles that I personally have picked up on the streets of U.S. cities. Without the scale bar, would anyone care to commit themselves about how large these things are? No, the picture is not faked. The larger beetle is a Long Horned Wood Borer (Coleoptera:Cerambycidae), total body length 75 mm from posterior to mandibles. The smaller one is a Carpet Beetle (Coleoptera:Dermestidae), total body length 2.5 mm. OK, so the picture's real. But is it "really macro"? What do you say, folks, and why? Waaaaay back in high school, I wasn't a photographer, but I was curious enough about it to read a book on closeup photography. The photos in the book had captions such as "fly shot at 1x" and similar. I was quite put out, since it was "obvious" to me that what the magnification was depended on how much you blew up the photo and printed it in the book! I did eventually figure it out, though. The term macro is hopelessly muddled, and barring a decree issued by a world dictatorship founded by a totalitarian closeup photographer, I doubt we're going to clear it up, whatever definition we might come up with here. For myself, I sling around "macro" quite a bit, but when I use it, I usually mean (and I assume the other person means, in the absence of agreement on a definition) "closeup photography of some sort". Of course, if I decide I want to be a jerk, I have the option to jump in when the other person uses macro loosely, and say "You realize that macro only refers to magnifications on the film or sensor greater than 1:1, right?" I think everybody would agree that a scale on the photograph helps because the final magnification can vary according to the media it is reproduced on. Many of our computer monitors differ in size, so we will see 1:1 images from the camera reproduced at different sizes, and what about natural history films shown at the cinema in the past. A 1:1 image in camera is hardly being reproduced at 1:1 if it is shown on a 30 foot cinema screen, the same applies to a lesser extent for slide shows. But from an equipment point of view it is handy to know if it will reproduce the subject natural size on the film or sensor. Therefore to fill your 4"x5" film frame with an image that fills our APS sized sensor you are going to need large format equipment that renders the subject many times life sized. You will also probably not get any better quality using large format to photograph the small subject at 1:1 on the film because you would have to enlarge this small section just as much as is required for the APS sensor and that would show the grain, plus enlarge the circle of confusion to the same extent. Your only advantage using large format therefore would be photographing larger objects at 1:1 not smaller ones, because for smaller ones either you need to enlarge the image similarly on reproduction to match that of the APS sensor, or invest in much more expensive equipment that will produce far greater magnifications than 1:1 to fill the 4"x5" film frame. And this may be even harder to find than for 35mm or APS. There seems to be little to gain photographing objects as small as the APS sensor at 1:1 on 4"x5" film because the final enlargement of the subject has to be the same for either format to produce equal final magnification for the viewer. In the end, not knowing the final magnification the subject will be shown at, there are only two useful pieces of information. The most useful being a scale on the photograph and the other that the equipment used rendered the subject at 1:1, or life size, on the film or sensor. Final magnification can be worked out from both those facts, other designations are misleading. The general rule in science is a term means what the original coiner of the term meant by it. Alas, I don't know who first invented the term Photomacrography and when it was first used, or even how they defined it. After all the term Photography itself is not really descriptive because it means "writing with light" whereas a better term would be "imaging with light". Language is just a means of communication, as long as it does that it has achieved it's purpose, whether it is correctly used or not!. I'm still puzzled about the fixation on 1:1. You write that "it is handy to know if it will reproduce the subject natural size on the film or sensor." I don't think I've ever cared about that, except as a fluke of working with a subject that happens to be the same size as my equipment. Now if you had said "it is handy to know if it will reproduce the subject full frame on the film or sensor", then I would be in complete agreement. Full frame matters because it affects secondary aspects of image quality, such as film grain or sensor pixelation. 1:1 matters only because, um, actually I can't think of a good reason. Maybe I'll just have to stay puzzled about this. Sometimes what people care about is just a matter of taste and can't really be explained. You raise a good point about the coiner of a term getting to define what it means. I don't know who first used the term "photomacrography". But I do know some of the field's other history, and I think you might find it interesting. You are correct that there's little to be gained in photographing small objects at 1:1 on 4x5 film. In fact, a much stronger statement is also true: there is little to be gained in photographing small objects on 4x5 film at any magnification. What's interesting is that this statement would have been considered completely wrong, verging on heresy, by early experts in photomacrography. In 1960, an article titled "Magnification and Depth of Detail in Photomacrography" was published in the PSA Journal. Written by H. Lou Gibson, that article was a masterpiece of analysis and exposition. It quickly became a dominant reference in the field. Its conclusions and recommendations were adopted into other publications, and became the basis for equipment selection and setup for many years afterward. They're still used even today. One important conclusion of the article was that bigger is better, in the specific sense that recording at high lens magnifications was shown to yield more DOF at same resolution, compared to recording at lower lens magnifications and then enlarging. The difference was not huge, but it was significant, and the recommendation was clear: to get the greatest DOF, use the greatest lens magnification. Quoting from the article: "Then the depth requirements would lead to the selection of an appropriate camera magnification." This conclusion was supported (weakly) by some photographic experiments, but Gibson had worked out the math in gory detail, starting from a detailed and completely reasonable model of the imaging process. The conclusion -- that higher lens magnifications give more DOF -- was shown to be a fundamental property of optics. Unfortunately, there was a mistake in the math. It was a small mistake -- use of lower-case "m" instead of upper-case "M" in one formula, as I recall -- but it was enough to completely change the character of the result. With the formula corrected (in 1986! ), the apparently fundamental advantages of larger lens magnification disappeared from the math, leaving only secondary issues such as film grain and enlarging lens blur. Since then, further advances -- notably lossless enlarging from small digital sensors -- have removed even most of the secondary issues. Another general rule in science is that understanding evolves. We now understand that lens magnification by itself is of no significance. The important thing is to fill the sensor, and even that doesn't matter if the sensor has more resolution (more pixels) than you need in the final image. a) The history is reviewed at http://www.photomacrography1.net/forum/viewtopic.php?t=4026&start=30 and its predecessor postings, which provide other links and references. b) The quote from Gibson's article is page 41, left column. The accompanying table shows computed DOF as 1.9mm for lens magnification m=2, versus 2.6mm for m=5.
" I prefer an easier definition of- It should show detail on the PC screen that you cannot see with the naked eye." I later added when the subject was within arms length to deter telephoto shots. As far as magnification definitions are concerned I'm happy with the 1:1 sensor definition as it describes the lens not the camera. I also sometimes use the term Print magnification to cover what the user finally sees. I have had very confusing discussions with people about this but think it is valid as described above where someone using a P&S camera in super macro mode can shoot at 0.3:1 (approx) and produce the same print magnification (at approx the same print size) as me shooting at 1:1 with my 1.6 crop camera. The question of what it means to be "macro" was explored in much more detail in another series of postings: http://www.photomacrography.net/forum/viewtopic.php?t=910 . There was considerable debate about my proposal, which prompted me to delve more deeply into the history of the term. I think it's important that this definition says absolutely nothing about the lens system that produces the picture, only about the picture itself, which must be "slightly enlarged". I believe the point of enlargement was to show detail that could not be seen on the real subject by the naked eye, at closest viewing distance. So, in this brave new world of low-resolution monitors, I think it's completely consistent to re-interpret the original definition in terms of visible detail. In fact, I don't see any reason to add some caveat like "closer than arm's length". The light does not care. Revealed detail is a function of magnification and aperture size (cone angle). It makes no difference to the light whether an image was captured at 6 inches or 6 feet, as long as the cone angle and final magnification are the same. The longer distance will require a much larger lens, of course. One might want to think of it as "long-distance photomacrography". It's true that the original author's example used a single microscope objective to project a magnified image onto a photograph plate, in a single step. But that was just a particular method. Adding "1:1 or higher on the film" into the very definition was done by later authors, for reasons that may have been clear at the time but are no longer relevant. All that you and I are doing is getting back to basics. What a pity that "zoom" is used for other purposes! It might have done the job, perhaps with a selection of prefixes to meet various applications.